Good morning! Wow! I've kinda been MIA for a few days, and I have no excuse other than being busy, busy, busy! There's so much excitement going on at Peachy Keen Stamps, with new products and stamps that have just been released, but... First things first, and that would be our current challenge. It's time for our Tuesday challenge over at the Peachy Keen Challenge Blog, and this challenge brings us yet another fantastic sketch, as well as a bit of a twist. The twist is that you will need to add some paper piecing on your image. 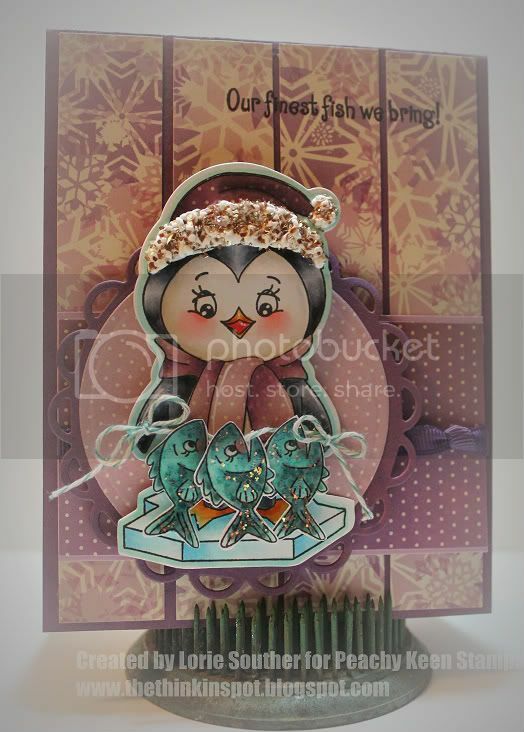 Here's my card, using the newly released PKS-07 Penguin Girl stamp set, and the coordinating Winter Character with Stocking Hat Kut Out which is a die that can be used with the Penguin Girl (like mine) or Snow Girl stamp sets. Oh my goodness, if you haven't seen these new cuties (and there are many), then you REALLY must check them out! So fun and versatile!!! For my card I used Stampin' Up! card stock and patterned paper from Cosmo Cricket's Mitten Weather collection. I paper pieced the hat and scarf with coordination paper from this 6x6 stack, and colored/shaded everything with Copic markers. The hat has a bit of liquid applique sprinkled with Champagne Glass Glitter from Stampin' Up!, and the fish were doused with some Icicle Stickles to give them a scaly/sparkly look. 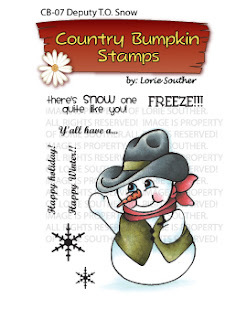 The Sentiment comes from PKS-11 Igloo stamp set. The background circle was done with circle Nestabilities and Lacey Circles Nestabilities. For added detail, I popped the fish up with foam dimensionals, and added the twine. I finished this card off with the plum colored grosgrain ribbon. This card was so much fun to color, and so easy to cut out with those Peachy Keen Kut Outs! Head over the the Peachy Keen Challenge Blog to check out all the fine details of the sketch, and to see what our amazing design team has created for your inspiration. Please help me welcome Cathy Martin who is guest designing with us today! I LOVE the name of her blog Snip Tuck, as well as her work and does she ever have some amazing artwork to share! These are all available at Peachy Keen Stamps RIGHT NOW, and please check back tomorrow, when I'll have some cute cards made with these very near and dear to my heart stamps. Thanks so much for stopping by today. As always I wish you a day filled with blessings and happy stamping! Holy Cannolis! I am loving your wee fish that your penguin is going to have for lunch! Another great card from my oh-so-crafty Sistah! That is one adorable penguin! Gorgeous coloring and your new images are cute, cute, cute! I need to get busy on my cards.... running late this year! Like you I've been busy, busy, busy! Hugs! Yipee!! They are adorable, Lorie!! 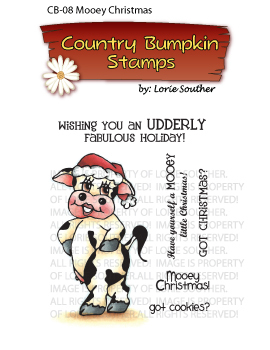 I can't wait to see your amazing creations using your new stamps! Your card, of course, is fall off the chair WONDERFUL! Your coloring is gorgeous and I just love the layout and papers you used. I just love the concoction you whipped up for the trim on the hat - pure genius! And a very, very I have been living under a rock CONGRATS on your stamp line! YGG! 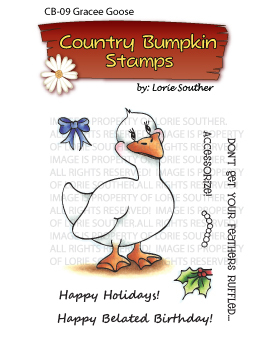 Congratulations on your new line of FABBYYYYYYYYYY stamps Lorie!! You are on a roll girlllll! Ohh an that penguin is tdf too!! Your way of coloring never cease to amaze me! What can I posibly add to top these comments! All I can say is, my jaw hit the floor when I saw your card and it's STILL THERE!!! Can't wait to get me those CB stamps too Lorie! OMG! 'nuff said! YOU ARE UNBELIEVABLE! Your creative mind beats all I ever seen!! Love ya, Lorie!